It all seems counter-intuitive, looking at those impressive pictures of jaguar warrior outfits sent every year to Tenochtitlan as tribute from provinces such as Acolhuacan, Petlacalco and Quauhnahuac (present-day Cuernavaca) (pic 1). What’s more, we know that the late post-classic Maya equivalent of jaguar warriors DID wear real animal skins - the Spanish friar Diego de Landa noted this at the time of the invasion: ‘Some... such as the lords and captains... went to war, clothed with feathers and skins of tigers and lions [jaguars and pumas] if they owned them’ (Sayer). Why would the Mexica not want to? ’Was this particular costume created out of the skin of a jaguar, or was it made of feathers, as were the other colourful warrior suits? The evidence overwhelmingly indicates the latter. ’Jaguar costumes are listed in the tribute section of the Codex Mendoza in red, blue, and yellow. Since there is no reference to animal skins being dyed, feathers must have been used. Also there is evidence that other animal costumes were constructed of feathers: Primeros Memoriales depicts eight different styles of coyote warrior costumes, each explicitly described as being made of feathers’. 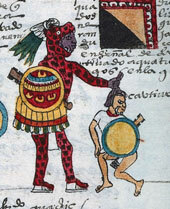 Rieff Anawalt, a world expert on Aztec costume, confirms in her seminal study Indian Clothing Before Cortés both the Nahuatl term for this unique, special-purpose, limb-encasing male warrior costume - tlahuiztli - and the fact that it was ‘constructed of feather-covered cloth, made in a variety of colours and styles’ (pic 3). Further evidence is provided by the narratives of the 16th century Anonymous Conqueror, who describes these limb-encasing costumes as ‘suits all of one piece and of a heavy cloth, which they tie at the back; these are covered with feathers of different colours and look very splendid’ (Sayer). The five most common colours (red, yellow, blue, green and black/white), as Pasztory suggests, may well have represented ‘the four cardinal directions and the fifth, the centre.’ And the use of feathers served a practical purpose too, providing extra warmth (Cordry). The birds chosen for their feathers to adorn costumes were generally the scarlet macaw, parrot (various), troupial, red spoonbill, blue cotinga, hummingbird and quetzal (Pasztory). How were the feathers applied to clothing? Often by being sewn on ‘to make designs by overlapping the colours’ (Pasztory). For the Aztecs, Fray Bernardino de Sahagún adds gluing (‘pasting’) as well as the use of ‘thread and cord’ (Sayer). What about the jaguar helmets? 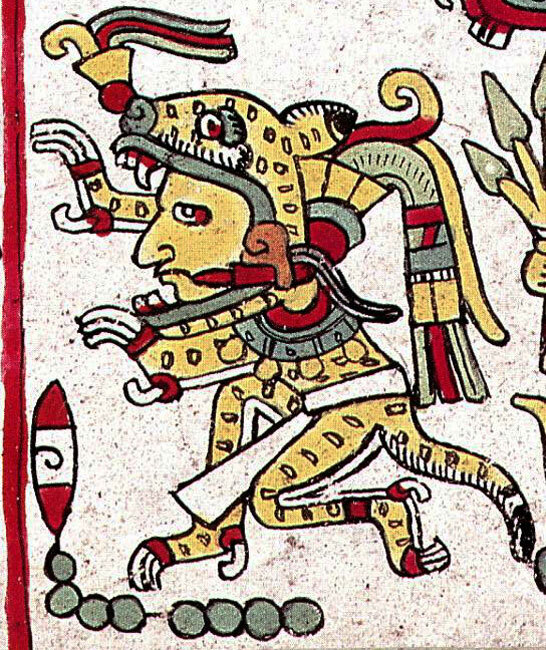 Again, part of the mystique suggests that Aztec jaguar warriors would have worn real jaguar heads as helmets; but no, these were almost invariably made of wood, and then decorated with feathers. Again, we have the evidence from the Anonymous Conqueror who wrote: ‘To defend the head they wear things like heads of serpents, or tigers or lions [jaguars or pumas], or wolves, and the man’s head lies inside the animal’s jaws as though it were devouring him. These heads are of wood covered on the outside with feathers or incrustations of gold or precious stones, and are something wonderful to behold’ (Sayer). 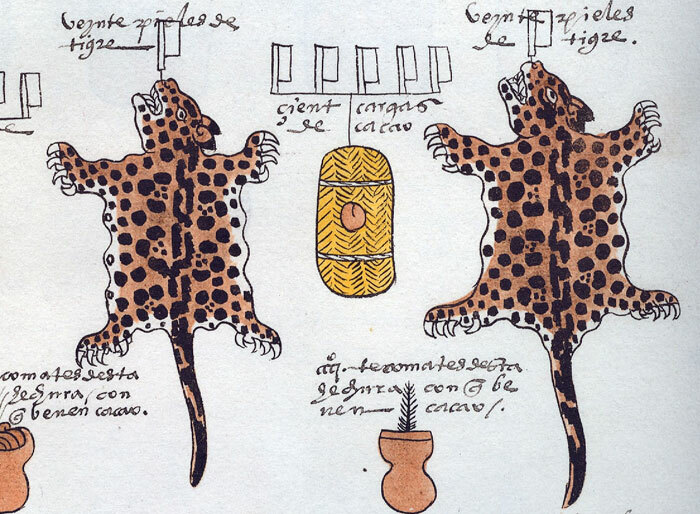 Finally, what happened to all those valuable jaguar pelts received by the Aztec emperor as annual tribute? (In fact, only one province is recorded in the Codex Mendoza as paying tribute in jaguar skins, Xoconochco on the Pacific coast - pic 5). 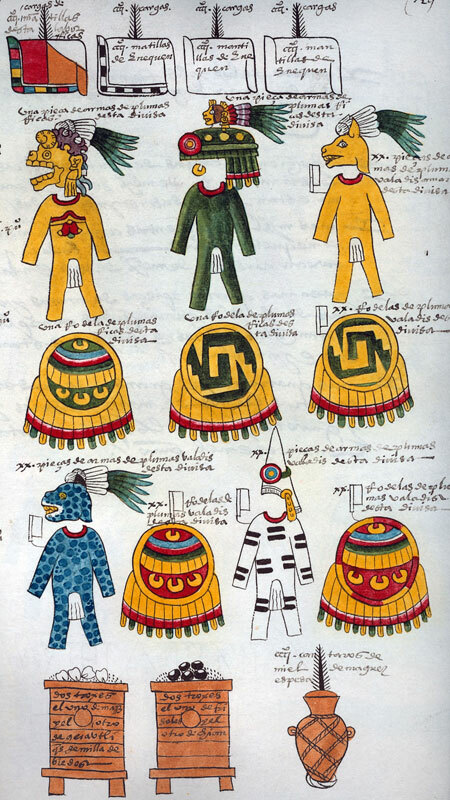 These skins, called ocelloyeuatl in Nahuatl, ended up largely as coverings for the nobles’ high-backed chairs, though apparently they were also prized by shamans for their magical properties (Berdan & Rieff Anawalt). • Mexican Indian Costumes by Donald and Dorothy Cordry, University of Texas Press, Austin, 1968. • Photo of warrior model by Ian Mursell/Mexicolore. Q. 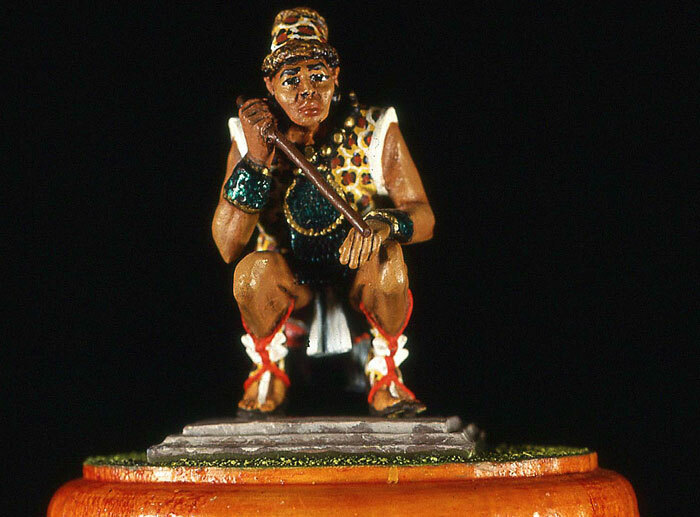 How did the Aztec emperor order his élite warriors to economise when times were hard? A. By telling them to tighten their pelts...!